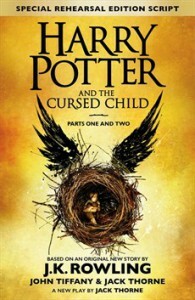 Harry Potter and the Cursed Child - J.K. Rowling, John Kerr Tiffany, Jack Thorne - review - So many books, such little time. Who? The Ministry kept it before, do you really trust them not to keep it again? Only you and I have experienced how dangerous this is, that means you and I have to destroy it. No one can do what we did Albus. No one. No, (slightly grandly) it's time that time-turning became a thing of the past. Twenty-two years after the Battle of Hogwarts, Harry and his wife Ginny wave goodbye to their second eldest son, Albus, as it's his first year at Hogwarts. Forever feeling like he's living in his father's shadow, their relationship becomes rocky and after over-hearing Harry talking to Amos about using a Time-Turner to bring back someone he loved, Albus takes things into his own hands. I did rather well to avoid spoilers and I went in with an open mind; this was nothing like I was expecting. I found many problems with this book. 1. Scenes from the original book series are included which I would count as cheating. 2. Every time Albus and Scorpius go back to the Triwizard Tournament in 1994, Ludo Bagman repeats the same thing every time; and they go back three times. 3. How can Voldemort have a child?!? He's missing a nose, what other body parts is he missing. 4. Finally, a plot hole. When Albus and Scorpius go back to 1994 the second time to the second task of the Triwizard Tournament, they humiliate Cedric by expanding his head so he then floats to the surface of the lake. This is where it might get complicated. Cedric is then angered, turns to the dark side and works with Voldemort. He kills Neville therefore Nagini is never killed with the sword of Gryffindor. Voldemort lives and Harry dies. But then if there's no Harry, there's no Albus. Therefore Albus won't have the motivation to save Cedric in the first place thus never going back in time... and we're stuck in a paradox. As a play in a theatre, it would look awesome. But as a book on its own... Not great. Harry Potter should have been left in the past.